What’s better than live music all night long?? Live music in SIX VENUES, all night long! Mountain Harvest Festival is proud to present a great line-up this year, coordinated by Melanie Jean. You can catch all bands because the music will be staggered and all on Grand Avenue, which will be closed to traffic for your convenience. The Paradise Theater (215 Grand Ave.) will feature flavors of eclectic world music, elemental and energetic with a surprise at 9:30pm. Across the street at the Blue Sage (228 Grand Ave.) will be the spot for your Blues Rock & Reggae fix, neighbored by some driving Indie Rock alchemy at Cirque Cyclery (232 Grand Ave.) . 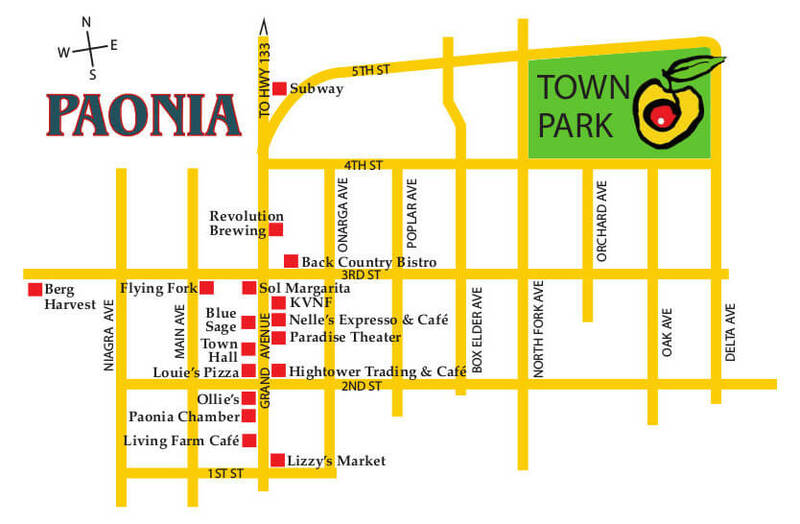 On the corner, Louie’s will spotlight your classic Rock ‘n’ Roll (202 Grand Ave.), and a block away in either direction you can catch some Psychidelic Funk at Paonia United Brewery (325 Grand Ave.). Weaving through it all, you’ll hear the steady thump of DJ Codestar’s Ecstatic Dance in Poulos Park, next to the Paradise. All bands are celebrated local and regional acts from the mighty Western Slope. Ten bands, seven venues, six hours of music, all for one low price! Are you interested in the bands at the Paradise, but not at the others? Perhaps the Blue Sage is more to your liking? You can get single venue admission for just $15 on the night of the show! All-access tickets are available until Thursday Sept. 21, 5pm at: Cirque Cyclery (232 Grand Ave.), Back Country Bistro (201 3rd St.) in Paonia, or at the Creamery Arts Center (165 W. Bridge St.) in Hotchkiss. And until Friday Sept. 22, 7pm at www.mountainharvest2017.brownpapertickets. Saturday Sept. 23, tickets may be purchased for $30 at Paonia Town Park Info Booth, 10am-5pm and Town Hall will be our box office for the evening of the concerts from 6-10pm. Wristbands are required to enter all venues. If you buy tickets online, get your wristbands at Paonia Town Park Info Booth, Friday 4-7pm, Saturday 10-5pm; and at Will Call at the Lamborn Building at 229 Grand Ave in Paonia from 6 – 8 pm. Music for everyone and prices for everyone; all in one Saturday Sundown Swingin’ block!